We’d love your help. Let us know what’s wrong with this preview of Amon's Adventure by Arnold Ytreeide. Another family "read together" story from popular author Arnold Ytreeide Following in the footsteps of his widely popular Advent series--Jotham's Journey, Bartholomew's Passage, and Tabitha's Travels--well-known author Arnold Ytreeide presents a captivating story to take families through the season of Lent, culminating on Easter Sunday. 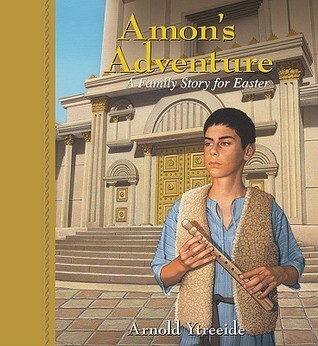 Thirteen-year-old Amon, the son of Jo Another family "read together" story from popular author Arnold Ytreeide Following in the footsteps of his widely popular Advent series--Jotham's Journey, Bartholomew's Passage, and Tabitha's Travels--well-known author Arnold Ytreeide presents a captivating story to take families through the season of Lent, culminating on Easter Sunday. Thirteen-year-old Amon, the son of Jotham and Tabitha, enjoys playing with his friends but is also ready to join his father in the temple court where only men are allowed. Eager to be considered a man, Amon struggles to divide his time betweenhis friends and his duties to family and faith. But when Jotham is falsely accused of a terrible crime, Amon willingly sacrifices his childhood ways in order to save his father's life. Along the way, he sees the jubilant crowds that gathered on Palm Sunday, outwits the Roman soldiers that planned to kill both his father and Jesus, hears the Messiah address the angry crowds, is present during the daring betrayal of Judas Iscariot, and witnesses the ultimate sacrifice made on Good Friday. To ask other readers questions about Amon's Adventure, please sign up. We love this series of books! It’s a great way to prepare our hearts for the season. The author is a master storyteller. These books are perfect for reading aloud. A fun Easter book that kids will enjoy. If you've enjoyed Jotham's Journey, Tabitha's Travels, or Bartholomew's Passage, you must read this volume as well. It is now 33 years later after that first Christmas. Jotham and Tabitha are married with sons of their own, one of them being Amon. Bartholomew also is still a close family friend, and one of Jesus' apostles. 13-year-old Amon is a skeptic of whether Jesus is truly the Messiah or not. As he goes on this spiritual journey, and as he changes from A fun Easter book that kids will enjoy. If you've enjoyed Jotham's Journey, Tabitha's Travels, or Bartholomew's Passage, you must read this volume as well. 13-year-old Amon is a skeptic of whether Jesus is truly the Messiah or not. As he goes on this spiritual journey, and as he changes from boy to man, he learns many valuable lessons about life and trusting God. And just as his parents witnessed a special birth, Amon's adventure takes him to Jesus' crucifixion. One of Arnold Ytreeide's trademarks is that he puts some fun, outrageous elements in his books -- just to make kids think... and laugh. In Amon's Adventure, we find out that Amon is an inventor extraordinaire. Yes, it sometimes is a bit too unbelievable that he invented backpacks, windows, fans, waterlines, etc. Alas, it ends up making for some hilarious, unforgettable moments. Reading again for Lent this year. It's like visiti Reading during Lent 2015. I love this book! 5th time reading it and it was just as good as the first time! I know I've read it a ton when I can hear the next line in my head. XD A couple of the parts were unrealistic but it was still a joy to read. Truly a great story that serves as a reminder of what Easter is truly about. Highly recommend to any age! We LOVE Arnold Ytreeide's work! He does such a masterful job of bringing these stories alive for my kids! I only wish he had even more resources because my kids get SO much out of them and I think that the Easter and Christmas stories will forever be more personal for them because of this author. Absolutely loved it and the kids did too. So glad we read it together during lent. Excellent way to enjoy the Easter season with your family. A wonderful retelling of the Easter story. It's so insuring. I love it so much. Cool. Fun. Amazing. I spent like half the day reading it. I say 100 thumbs up for it. Arnold Ytreeide writes THE BEST advent books EVER!!! We own every advent book he has written, (even the easter story one). And we read them over and over agian every year:)! Arnold Ytreeide's Advent titles have been part of our family's Advent tradition for years. The characters in Jotham's Journey, Tabitha's Travels, and Bartholomew's Passage have become well-loved friends over the years as we've cycled through these books. So I was thrilled recently when a friend let me know that author Arnold Ytreeide had just published a similar book for the Easter season featuring the children of Jotham, Tabitha, and Bartholomew! I promptly ordered a copy. The whole family was e Arnold Ytreeide's Advent titles have been part of our family's Advent tradition for years. The characters in Jotham's Journey, Tabitha's Travels, and Bartholomew's Passage have become well-loved friends over the years as we've cycled through these books. So I was thrilled recently when a friend let me know that author Arnold Ytreeide had just published a similar book for the Easter season featuring the children of Jotham, Tabitha, and Bartholomew! I promptly ordered a copy. The whole family was excited to get started! 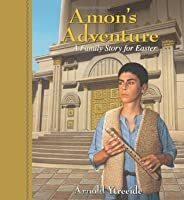 Amon's Adventure takes place in Jerusalem in the weeks leading up to Passover and Christ's crucifixion. Amon, the thirteen-year-old son of Jotham and Tabitha, is eager to be recognized as a man in the community. But when his father is wrongly accused of a terrible crime, he finds the role thrust upon him in a way he never imagined! The excitement and suspense build as Amon searches for a way to save Jotham's life. Along the way, you'll meet such characters as Gamaliel, Saul of Tarsus, Caiaphas the high priest, Judas Iscariot, and of course, Jesus of Nazareth. Just as in the Advent books, the story is broken into fairly short chapters, each ending with a short devotion. The most common method is to read a chapter a day beginning on the fifth Saturday before Easter and finishing on Easter Sunday, but several alternate reading plans are also suggested. We got our book a little bit on the late side, so we've been reading two chapters a day, first to catch up, and now to stay ahead, since I know there are a few days in the next couple of weeks when we'll miss reading. I'll admit that I've skimmed ahead to see how the plot unfolds, just don't tell my kids! Even after two chapters, everyone always begs for more. The story is fast-paced, fascinating, and at times humorous. Each chapter is a cliffhanger, leaving you eager to know what happens next. The devotions are short and to the point. They've led to some good discussion for us. In my experience, there are a number of Advent resources and activities to choose from, but I've seen little for Lent. I own a couple of things, but nothing that we've absolutely loved. We really enjoy our Resurrection Eggs and Benjamin's Box, the accompanying book, but they're not meant to be a devotional that covers the entire season. I'm thrilled to have something comparable to our Advent family storybooks for Lent! 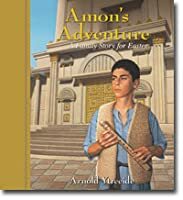 Yes, I realize this suggestion is a bit belated for most of you to use Amon's Adventure this year (although it's worth checking to see if your local Christian bookstore has a copy in stock so you could begin immediately! ), but it's never too late to begin planning for next year! I have no doubt that Amon's Adventure will join it's predecessors as a well-loved yearly tradition for our family. An excellent Lent preparation book for the family! The story is broken up into chapters, each with it's own lessons and scriptural reflections. Follow a young Jewish boy on his spiritual journey, which takes place around the final days of Jesus's passion. Although Amon is a fictional character, his various adventures and challenges draw readers and listeners into a more personal understanding of the Biblical environment. Loved the first in the series but this one was a little slow and harder for my son (9yo) to follow and stay attentive to. The thoughts at the end of each day seemed a little repetitive and weren't really geared towards someone who is already a Christ follower. This would be more geared towards children who were undecided about Christ. Highly recommended to read in the days or weeks leading up to Easter. The book is divided up into daily readings with a discussion that follows. Really enjoyed the story line with all the action and adventure. Amon has a lot of soul searching he needs to do and we see him starting to rely less on himself and more on God. I was afraid this book would be incredibly corny, but I was pleasantly surprised that the story was engaging and interesting. my kids asked for me to read it, which showed they cared about what was going to happen. the devotions at the end of each chapter were well done. We absolutely love all of the books in this series. The chapters have excellent cliff hangers, there are great plot twists and lots of moral dilemmas to chew over but, most importantly, all point the way to Jesus. Another fantastic book from this author. My children were completely enthralled with this story set during Lent. We loved seeing some of our favorite characters again. I hope that more stories set during the Lenten season are soon to come. Our family loved reading this book as part of our Easter preparation/celebration this year. I would say our 5 year old was a little less interested in following the sometimes complex storyline, so I would recommend for ages 6 and up. Class read aloud-- they really love this story and it gives them insight into the time of Christ despite the author's overdramatic tendencies and inconsistencies. Everyone asked to read the next one, but there are no more. We love this author. This was a more difficult/drawn-out read than the Advent series.